Here we get to meet our forbearer life forms and learn how they help us today. These ancient fossils are the guardians of ancient secrets of manifestation (and the Fibonacci sequence). They open the door to the Akashic records and act as keepers of knowledge. This makes them wonderful companions and teachers on your path to deeper metaphysical and spiritual understanding. 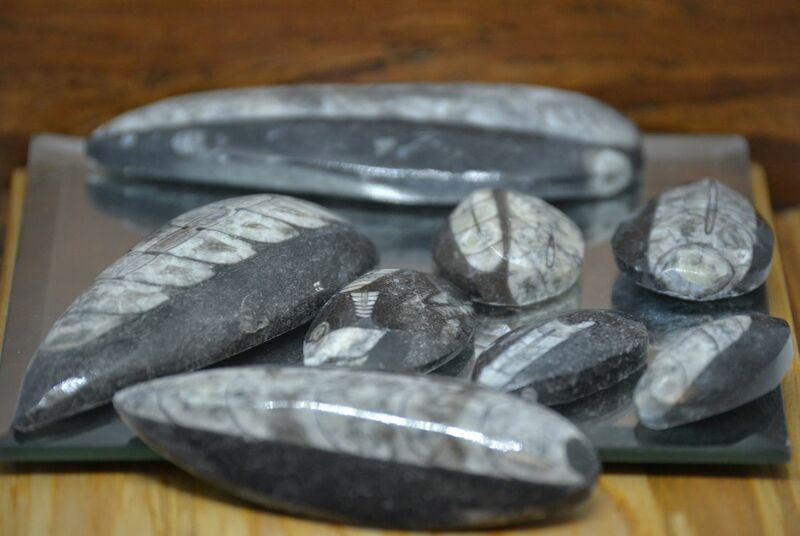 Orthoceras are have powerful healing and transformative properties due to their ability to connect you to ancient pure healing light. They work to release blockages and to clear any resistance to spiritual and emotional growth by removing negative energies and releasing any karmic attachments that might be holding you back. As a fossil it’s intuitive and strong earth energy is a powerful force that works through the heart chakra to unblock all energetic pathways which will allow increase vibrant vital energy to flow. This is also a powerful stone of balance and centering that restores harmony to mind, body, and soul by restructuring energy fields, recentering unfocused energy leaks, and activating the kundalini life force spiral. Their energy will work to gently guide you into complete universal connectivity which opens you to pure oneness and unconditional love. They teach us to focus on the now by living in the moment and remind us to stay true to our inner self throughout our journey. They help us to continue to expand and grow by bolstering our confidence, strength, and courage to follow our true soul call to the path of our greatest joy. Orthoceras is an ancient mollusk that lived 500 to 190 million years ago years ago from the early Ordovician Period up to the Triassic period (covering about 300 million years). The name means “straight horn,” referring to the characteristic long, straight, conical shell. The squid like creature had a soft body which lived in the last open-ended segment at the large end of the conical shell. As the body grew and the housing segment became too small, a new larger chamber would grow and then a dividing wall, called the septa, grew to separate the old “home chamber” from the new one. These chambers can be clearly seen on the fossil itself. On some examples of these fossils a tube running the length of the fossil can be seen, this tube is called a “siphuncle” and it ran the entire length of the shell through each chamber and served to allow the animal to raise and lower itself to different depths by controlling buoyancy. It also could increase movement speed by acting as a “water jet” that it could spit out. These impressive creatures ranged in size from less than a centimeter to more than 14 feet long! 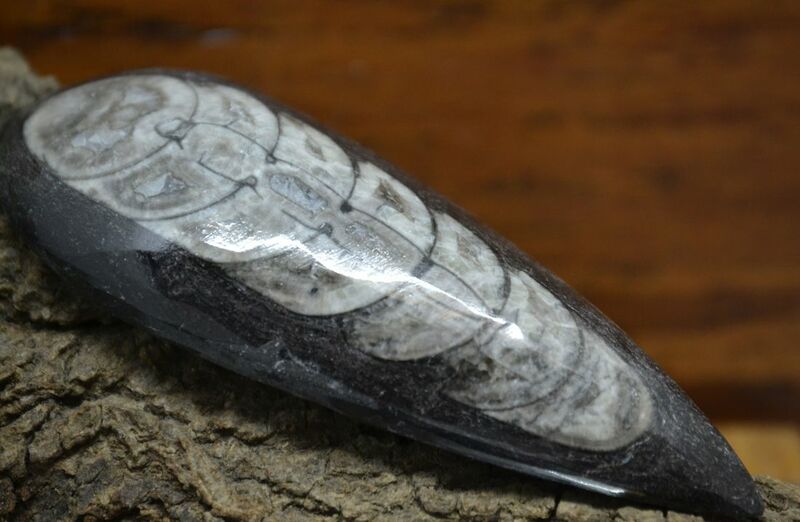 Due to the rapid decomposition of the soft body upon death only the hard shell of the Orthoceras is preserved in the fossilization process. They are believed to share a common ancestor with the popular fossil Ammonites, yet the two creatures are not widely believed to be directly related. Though the similarity in use of chambers, partitions, and siphuncle openings lends credence to this theory along with ammonites development of a coiled shell (gifted by it’s late Devonian period ancestor Goniatites) which seems an evolutionary improvement from the unwieldy and easily damaged long conical shell of the Orthoceras. The living relatives of Orthoceras today are most closely and notably the squid (as orthoceras are often referred to as “ancient squids”) but they are also related to octopus, cuttlefish, and even the nautilus.